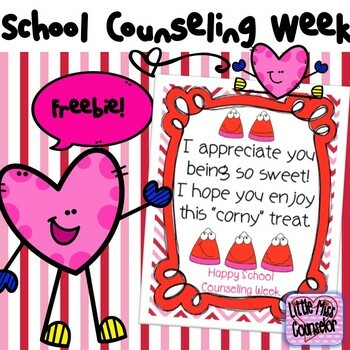 Celebrate School Counseling Week in style with this poster. Use with Valentine candy corn for the perfect treat! •	Please go to your My Purchases page (you may need to login). Beside each purchase you'll see a Provide Feedback button. Click to give a quick rating and provide a comment for the product. Each time you give feedback, TPT gives you feedback credits that you use to lower the cost of your future purchases. 1. Your purchase is for one user only unless otherwise noted. 2. Downloading, saving, scanning, or placing free or paid product(s) on sites that allow multiple users to access is not allowed. This may include, but is not limited to emailing, using a shared drive/files, dropbox, blog, or website including school web pages. 3. This product and it accompanying clipart/fonts are copyrighted. Copying or sharing this product, or extracting graphics is prohibited and a violation of the violation of the Digital Millennium Copyright Act (DMCA). Multiple user licenses are available at a discount rate. 4. For personal/educational use only! Commercial use in part or whole is strictly prohibited. 5. Feel free to share a picture of this activity in action, just tag @littlemisscounselor on Instagram or Facebook and provide the product link.